Handbrake is famously known to allow you to rip DVD’s but the new version also works wonders as a video conversion tool to get your favorite videos and movies onto your iPod touch, iPhone, iPad, and Apple TV. 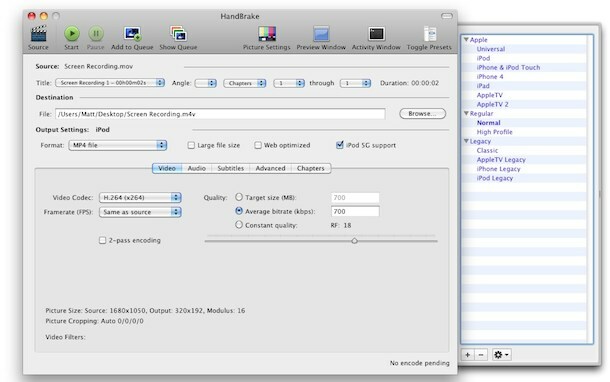 If you’re new to video conversion, don’t worry, Handbrake is extremely easy to use and it’s free to download. So let’s find out how to convert a video to the iOS compatible format and optimize it for your hardware. Download the latest version of Handbrake from here. Handbrake is free and works for Mac OS X, Windows, Linux, these instructions apply to all platforms. Select the source video file you want to convert to iPod, iPhone, Apple TV compatible formats. DVD, AVI, MOV, MKV, etc all work fine. Note: Conversion settings are different from the iPod (classic) and the iPod touch, so be sure to specifically select iPod touch if you plan on watching video on that rather than a classic iPod. Also, if you have a new iPod touch with retina display, be sure to select ‘iPhone 4’ instead. The videos will still play fine if you don’t do this, they just won’t look as good since they won’t be optimized for the hardwares native resolution. When Handbrake is done converting the video, you’ll get a message and you can find the video in the destination source you set. The default is your desktop, so if all else fails just look there. You can tweak a bunch of settings within Handbrake to further optimize and compress conversions, but for quickly converting videos it’s not really necessary since the default settings are spot-on. If you’re new to converting video, the only setting I would recommend adjusting is the output format from the side tray, just choose the iOS hardware that you are most likely to watch the video on and it will optimize it for that. You’ll notice that the video settings adjust based on the iOS hardware selected, this is because the iPad and iPhone has a different video resolution than an iPod, which supports different resolutions than a new Apple TV or an iPod touch, and so on. Selecting “Universal” aims to go for universal compatibility, with a 720×448 resolution. Remember, video always scales down to lower resolutions fine, but video scaling up is where you’ll notice the compression artifacts and screen pixelation, so if in doubt select a higher resolution to convert to and you’ll be able to enjoy it on a wider spectrum of hardware. Handbrake also works VERY well at converting difficult video formats, like Sony Hard Drive cameras, to something usable in iMovie.